The MHA Nation Bridge Feasibility Study Request for Proposals deadline has now closed. 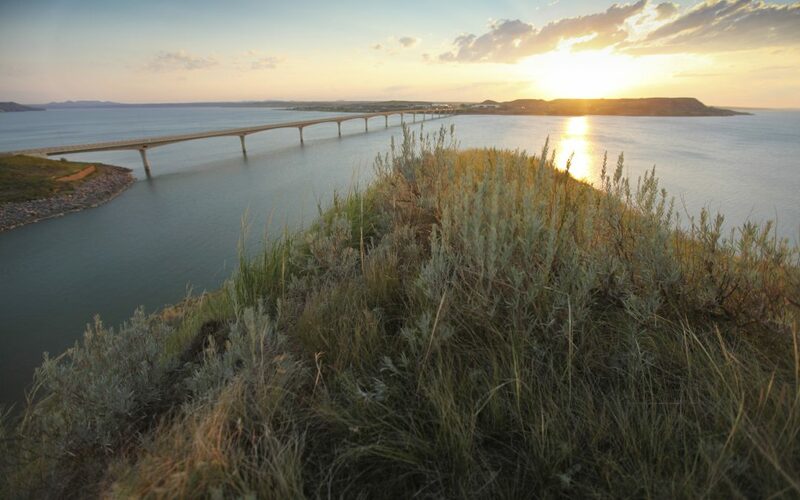 This MHA Nation Bridge Feasibility Study is part of the Fort Berthold Comprehensive Regional Transportation Plan and will provide an in-depth assessment of the feasibility of building the proposed Charging Eagle Bay Bridge and Elbowoods Bridge on the Fort Berthold Reservation. The feasibility studies for each bridge should address local and regional social and economic impacts, overall constructability concerns, procurement and financing strategy and impacts on existing infrastructure. A broad public and stakeholder outreach effort is required to provide education about the study approach and identify needs and concerns. Please use the link below to view the Request for Proposal in its entirety. This page also contains useful historical and transportation related documents including the original Army Corps of Engineers Draft Environmental Statement (from the original proposed Charging Eagle Bay Bridge project) as well as MHA Nation’s TERO Regulations. If you have any questions, please direct them to ron@bubarhall.com. Check back to this page for the published questions and answers as described in the Request for Proposal. Does MHA Nation have a standard form contract that will be used on this project or can a Consultant provide their own contract form? Can we get a copy of the Tribal contract form? MHA Nation has a template for professional services contracts that will be modified for this project. The two main issues (in addition to addressing the scope of work) contractors and subcontractors have to address are: 1. Disputes will be resolved in tribal court and, 2. The Tribe’s Tribal Employment Rights Office (TERO) regulations regarding hiring and subcontracting will be applied. The TERO regulation is posted above with the RFP. Since this project includes federal funds, the prime contract will also incorporate required federal contract clauses. Some items are open to negotiation and any contractor offered provisions will be considered at the contract award stage of the process. The Tribal contract form cannot be posted on this website, but will be made available upon award of contract to the selected firm. How does MHA Nation define "financing strategy" (as noted in the RFP in regards to the feasibility studies for both bridges) and how should this strategy be developed? A primary objective of the study is to develop a process and document(s) that informs the Tribal Leaders and community members about how infrastructure is developed, how it functions, the operational demands, and the trade-offs that government and the community must consider in their long range planning and priorities. If one or both bridges are to become reality (feasible), funding will have to be identified and committed in a time-frame commensurate with each stage of the project from concept to operations. The financing strategy should address all funding options, the processes required for each, the resources required to successfully secure the funding, and provide case studies or other examples to illustrate the application of that financing alternative. The strategy should address the fact that several non-tribal stakeholders (federal, state, local, private) will benefit from this project and may participate in the financing of the project. This strategy will address public or private alternatives, including those unique to tribal governments generally, and financing particularly available to the Three Affiliated Tribes. It is anticipated that multiple funding sources will be required. Our attorneys are requesting the following changes to the indemnification clause: To the extent claims or legal actions fall under Professional Liability insurance coverage, they shall indemnify and defend the Tribe against any and all claims or legal actions to the extent caused by or arising out of their negligent acts, errors or omissions in the performance of the contract, whether or not such claims relate to damages or alleged damages sustained by physical injury to contractors personnel, subcontractors, utility employees or other persons, or against any lawsuits arising from alleged or actual patent infringements, and shall hold MHA , its various departments, employees, and any and all persons or entities acting on its behalf harmless from the same. Is this acceptable to MHA? There will be an opportunity to negotiate contract terms with the successful firm during the contract award process. The Tribe’s Legal Counsel will take the lead in negotiating all contract language. Are you looking for a standard bridge with little or no aesthetic enhancements or are you wanting an aesthetically enhanced bridge? The consultant will be expected to identify various bridge types that are functionally feasible for the prescribed crossing area, and facilitate a discussion about alternatives for aesthetic enhancements, including the costs (design, construction, maintenance) and other considerations. How would you like the price sheet submitted; separate envelope and booklet or bound in main book in closed envelope? If included in the proposal, does that count as one of the fifty pages? The Price/Budget Sheet should be submitted as a separate document from the main proposal. It may be in a separate envelope, but should be distinctly identified as the Price/Budget Sheet. The Price/Budget Sheet will not count as one of the fifty pages limited in the main proposal. Is there a prescribed format for the price submittal? There is no prescribed format for the price submittal. The price submittal should contain sufficient information for the review team to determine the value of the services and products to be delivered, and that the project will be delivered within the stipulated budget. What is the time frame for completion of the work? It is anticipated that the work will be completed within one year from the notice to proceed. How do you see this fitting into a State Highway Program or Federal Highway Program? A significant consideration in the feasibility of the project is the eligibility for financing from various sources, including state, federal and private entities. The consultant should provide a full description of each option including the financial, operational, and jurisdictional tradeoffs with each. An EA was completed in 1974 for the Charging Eagle Bay crossing. Have there been any updates since then? If not, will a new EA be required? If so, would it be an EA or an EIS? There have been no updates to the 1974 document prepared by the Army Corps of Engineers. The consultant will be required to advise the Tribe regarding the environmental laws and regulations that will apply to the project, including the processes and constraints required for development. What State and Federal agencies will be involved per the requirements of the funding source (TIGER)? The U.S. Department of Transportation has not specified which state and federal agencies must be involved in the project. However, the scope, context and scale of the project has the potential to involve many agencies for permits, funding, data and support. Regarding TERO Certification, do members of the team who will be involved in engineering, analysis and support services that will be completing work in their respective offices need to be TERO certified? Can the certification for those completing work on-site be obtained after selection? We are seeking a response from the TERO office. We will let you know when we have that response.